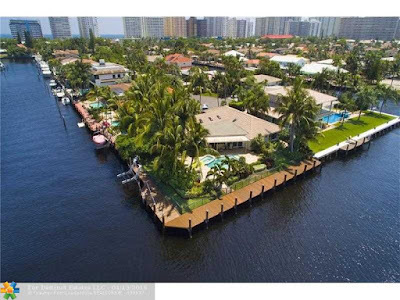 Broward Real Estate: Waterfront Estate For Sale In Fort Lauderdale! The pristine direct Intracoastal Point home in Bermuda Riviera located in sun drenched city of Fort Lauderdale is a must see. This home boasts one hundred and seventy eight feet of waterfront. You can actually dock a mega yacht in this deep water area. This is the ultimate luxury South Florida lifestyle. This three bedroom, two full bathroom and one half bathroom home is generously laid out over two thousand and four hundred square feet of perfectly appointed living space. The chef's gourmet kitchen features sleek granite counter tops, a full suite of designer stainless steel appliances, and custom wooden cabinetry. All the glass windows and doors throughout the home are high impact. The sparkling pool and relaxing spa are overlooking the scenic water vista. This corner lot home has an open floor plan for a open airy feel and tons of natural lighting. You can view wide open water from almost every room in the home. Fort Lauderdale is known for their world class dining, nightlife, entertainment and shopping at nearby Los Olas Riverfront, Galleria Shopping Center, and the Broward Performing Arts Center. The Fort Lauderdale airport is just a short drive from this residence.